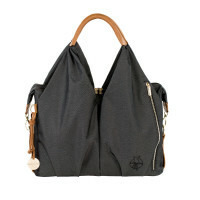 The Diaper Bag Green Label Neckline Black Mélange is made of sustainable spin dye material. The dyeing process significantly reduces water consumption. 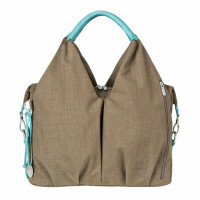 Product information "Green Label Neckline Spin Dye Diaper Bag, Black Mélange"
The popular Green Label Neckline Bag from LASSIG is available in three additional models made of sustainable spin dye fabric in trendy colors: Blue Mélange, Black Mélange and Gold Mélange. Just like the other Green Label materials, this new material is very environmentally friendly. During the spin dye process, the color is added to the melted raw material before the material is spun into thread. This process eliminates the dye bath which would otherwise be necessary and thus eliminates the large amount of water usually associated with dyeing. By shortening the dyeing process time compared to the traditional dyeing process, water consumption is reduced dramatically, less effluent is produced, CO2 emissions are reduced and energy is saved. Like the other models, this sustainable companion during the diaper-changing years naturally features a well-organized inner compartment with plenty of space to store baby utensils as well as personal items. 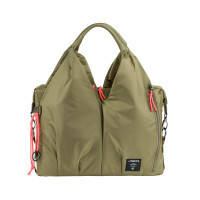 The bag comes with an extensive array of accessories, including a water-repellent changing mat, an insulated, removable bottle holder, a pocket for utensils, removable baby food jar compartment, stroller attachment and an additional adjustable shoulder strap. There's even a place for your cell phone in the integrated cell phone compartment in the outer pocket. You can attach keys directly to the key finder and stow baby wipes in their intended compartment inside the bag. 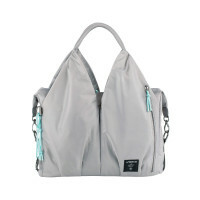 The bag also features a water-repellent wet pocket and an insulated external zip pocket to keep drinks warm or cold. The perfect accessory for an exciting walk around town with your child and friend – even after a diaper change. Lassig develops innovative, cheerful, eco friendly and captivating products for children and parents. Our award-winning diaper bags are designed with recycled materials, produced sustainable and are as colorful and diverse as life itself. We are inspired by streets and catwalks worldwide. 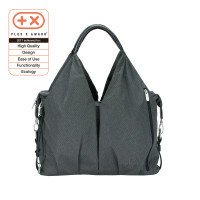 Working as a team, we design bags, textiles and other beautiful and functional things for people who want to emphasize their zest for life and their individuality by choosing high-quality, casual products. And Lassig supports the responsible task of parents with functional products that not only fulfill their specific needs in everyday life – but also those of a sustainable lifestyle. 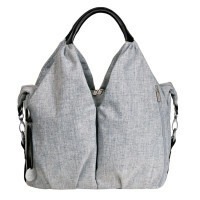 Therefore, LASSIG only manufacture our bags from uncritical materials which are tested for harmful substances. We make way for the joy of living, activity and a conscious sustainable use of resources offered to us by nature.